Constance M. Hilton, Attorney at Law, represents the interests of children with disabilities and their families in special education cases and other school-related matters. A graduate of the University of Illinois and Suffolk University Law School, Connie Hilton has practiced as a lawyer for more than 30 years. Attorney Hilton's primary focus is representing clients throughout Massachusetts in education law, children's law and special education law. She advocates on behalf of children with disabilities and their families to ensure they receive the services, accommodations, and placements that they need to thrive and succeed. Connie also represents students in school disciplinary matters. She works to ensure that any suspensions or expulsions are fair and takes into consideration the circumstances and needs of the child. 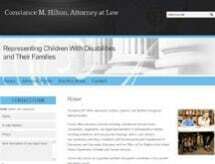 She also provides counsel and representation to parents of disabled children in school proceedings. In addition to providing education-related legal services, Ms. Hilton is available to serve as a guardian ad litem or family co-coordinator in probate court matters and as a guardian ad litem in juvenile court matters. Connie's dedication to her field is evidenced by her avid participation in organizations and activities related to parenting and children's rights. The mother of two children, Connie is a frequent speaker at conferences and workshops for parents and advocates as well as for legal professionals and mental health professionals. She is a member of the Council of Parent Attorneys and Advocates (COPAA), the Massachusetts Association of Guardians-ad-Litems (MAGAL), and the Special Needs Advocacy Network (SPaN). Earlier in her career, Connie served as a hearing officer for the Bureau of Special Education Appeals (BSEA), and was Deputy General Counsel for the Office for Children (OFC). She was also a founding member of the Cambridge Women's Commission, co-chair of the Special Education Parents' Advisory Committee for Cambridge, a board member for the Cambridge Guidance Center, a member of the Cambridge Kids' Council, and a board member for the Child Care Resource Center. If you are the parent of a child with special needs and require legal representation or advice, the experience and advocacy that Connie brings to her work can assist you to understand you and your children's rights and to achieve a fair and appropriate outcome for your child and your family. Contact Ms. Hilton for a confidential consultation today.